Radon is a cancer-causing, radioactive gas. In Kentucky, around 40% of our homes will have levels above the EPA action level of 4.0 pico curies per liter of air. In Louisville KY (Jefferson County), the level increases to over 60%. The levels of Radon Gas depend on the type of soil and rock structure beneath our homes. The Radon levels vary across counties and will vary from house to house in the same neighborhood. Fortunately, it is usually easily mitigated by a Radon Professional. Costs will run $800-$1,000 and should include a follow up test showing the radon mitigation system is doing its job. On the seller’s disclosure form, the sellers are asked if there has been any testing for Radon gas. If so, what were the results? If the home inspection results show a high level of Radon gas, the buyers will often ask the sellers to install a Radon mitigation system. See below for Radon Facts, Radon Map of KY, and various publications from KY Association of Radon Professionals as well as the EPA. Radon is a cancer-causing, radioactive gas. Radon is a naturally-occurring radioactive gas released in rock, soil, and water from the natural decay of uranium. While levels in outdoor air pose a relatively low threat to human health, radon can accumulate in dangerous levels inside buildings1. Exposure to radon is the leading cause of lung cancer in the United States among non-smokers, second only to smoking1. The US Surgeon General and US Environmental Protection Agency (EPA) estimate that radon causes more than 21,000 lung cancer deaths in our country each year1. Only smoking causes more lung cancer deaths1. If a person smokes and has elevated radon levels in their home, their risk of lung cancer is higher1. Radon is found in toxic levels throughout much of Kentucky. 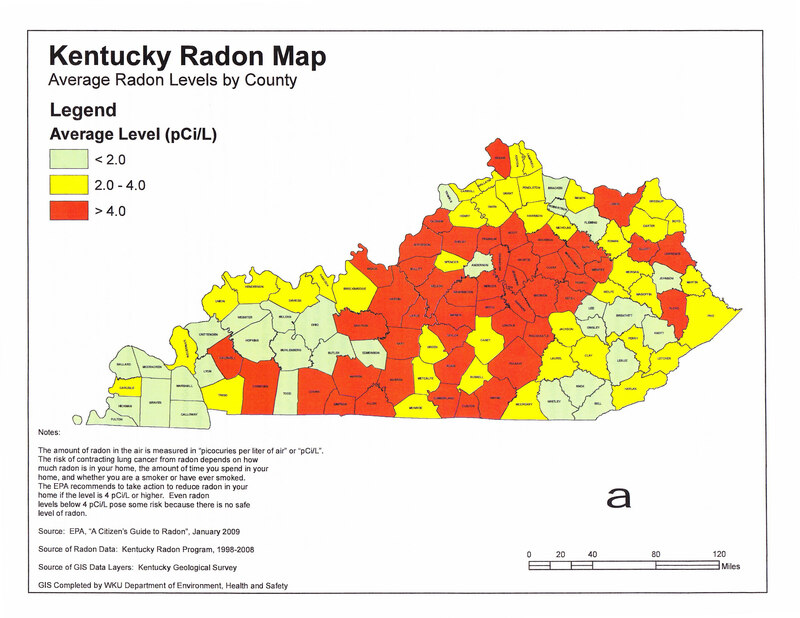 Radon has been found in elevated levels in every county in Kentucky1. No area of our state is risk-free. Nationwide, approximately 1 in 15 (7%) homes test above the action level established by the EPA of 4.0 pico curies per liter of air (pCi/L)1. Approximately 42% of all Kentucky homes will test above the EPA action level2. In some areas, greater than 65% of all homes will test above the action level2. This means that nearly half of our population is exposed daily to toxic levels of radioactive radon. Kentucky leads our nation in lung cancer death rates3. Radon contributes greatly to high lung cancer incident rates within our state. Exposure to 4.0 pCi/L is equivalent to the radiation received from 200 full chest x-rays per year4. Exposure to 8.0 pCi/L is equivalent to smoking a pack of cigarettes per day4. The national average radon concentration found in homes is 1.3 pCi/L1. The average radon concentration found in Kentucky homes is 6.7 pCi/L2. When coupled with smoking, this creates a synergistic effect that greatly increases lung cancer risk1. Smoking is not the only reason our state leads the nation in lung cancer death rates. 2Kentucky Cabinet for Health and Family Services. Kentucky Radon Program. Kentucky Radon Test Results, 2009. 3U.S. Cancer Statistics Working Group. United States Cancer Statistics: 1999-2005 Incidence and Mortality Web-based Report. Atlanta: U.S. Department of Health and Human Services, Centers for Disease Control and Prevention and National Cancer Institute; 2009. Available at: www.cdc.gov/uscs. 4US Department of Health and Family Services. Public Health Service. Toxicological Profile for Radon. (1990). For more information about Radon in the Greater Louisville area, feel free to contact Tim Hollinden with The Hollinden Team. If you click on the picture below, a larger PDF will open in another window showing more detail.